Samples of hornblende, a common type of amphibole. Amphibole defines an important group of generally dark-colored, rock-forming silicate minerals. Some are constituents of igneous rocks, and others are part of metamorphic rocks. Hornblende is the most common subgroup of minerals in amphibole. Metallic ions found in different types of amphiboles include iron, magnesium, calcium, aluminum, and sodium ions. The name amphibole (Greek αμφιβολος/amfibolos, meaning "ambiguous") was used by René Just Haüy to include tremolite, actinolite, and hornblende. This term has since been applied to the whole group. Amphiboles are composed of double-chain silicate (SiO4) tetrahedra, which are linked at their vertices. They generally contain ions of iron and magnesium in their structures. Amphiboles crystallize to produce two crystal systems: monoclinic and orthorhombic. In chemical composition and general characteristics they are similar to the pyroxenes. The chief differences between amphiboles and pyroxenes are that amphiboles contain essential hydroxide ions, and the basic structure of an amphibole is a double chain of silicate tetrahedra, as opposed to the single chain structure of pyroxene. In addition, hand specimens indicate that amphiboles form oblique cleavage planes (with angles of around 120 degrees), whereas pyroxenes have cleavage angles of approximately 90 degrees. Amphiboles are also specifically less dense than the corresponding pyroxenes. Numerous subspecies and varieties of amphibole are known, the more important of which are shown below. The formula of each is built on the general double-chain silicate formula RSi4O11. Yet the overall chemical compositions vary widely, as a result of which the different members show considerable variations in their appearance and properties. Anthophyllite occurs as brownish, fibrous or lamellar masses with hornblende in mica-schist at Kongsberg in Norway and some other localities. An aluminous variety, known as gedrite, and a deep green Russian variety containing little iron as kupfferite. 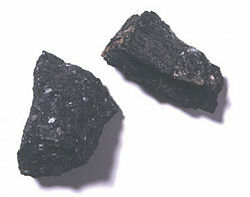 Hornblende is an important constituent of many igneous rocks. It is also an important constituent of the rock known as amphibolite, formed by metamorphism of basalt. Actinolite is an important and common member of the monoclinic series, forming radiating groups of acicular (needle-like) crystals of bright green or grayish-green color. It occurs frequently as a constituent of greenschists. The name (from Greek ακτις/aktis, a "ray" and λιθος/lithos, a "stone") is a translation of the old German word Strahlstein (radiated stone). Glaucophane, crocidolite, riebeckite and arfvedsonite form a somewhat special group of alkali amphiboles. The first two are blue fibrous minerals, with glaucophane occurring in blueschists and crocidolite (blue asbestos) in ironstone formations—both result from dynamo-metamorphic processes. The latter two are dark green minerals that occur as original constituents of igneous rocks rich in sodium, such as nepheline-syenite and phonolite. Pargasite is a rare, magnesium-rich amphibole with essential sodium, usually found in ultramafic rocks. It is hard, dense, and black, with a red-brown pleochroism when examined in thin section. ↑ Pleochroism is an optical phenomenon in which light traveling through a colored crystal is refracted and divided into two paths that are polarized at a 90° angle to each other. As the light beams leave the crystal, they exhibit different colors, making the stone seem to be of different colors. Windows to the Universe: Amphibole University Corporation for Atmospheric Research. This page was last modified on 16 March 2016, at 16:54.